Eight Palms Accommodation offers 3 lovely units in a peaceful setting in the heart of Port Edward. The property is located only 500 meters from the main beach and 200 meters from the shops and restaurants. The Cottage is self-catering and offers comfortable beds for up to 6 people. Preferably 4 adults and 2 children as the 3rd bed is a quality double sleeper couch. The kitchen is fully equipped and features a 2 plate stove, fridge / freezer, microwave, toaster, kettle, coffee & tea station, crockery, cutlery, pots, pans, bowels etc. The lounge and dining area is open plan where the 2nd bed and sleeper couch are part of the family area. There is a dining table with seating for 6 and the lounge is equipped with a flat screen TV, featuring full DStv as well as free Wi-Fi. 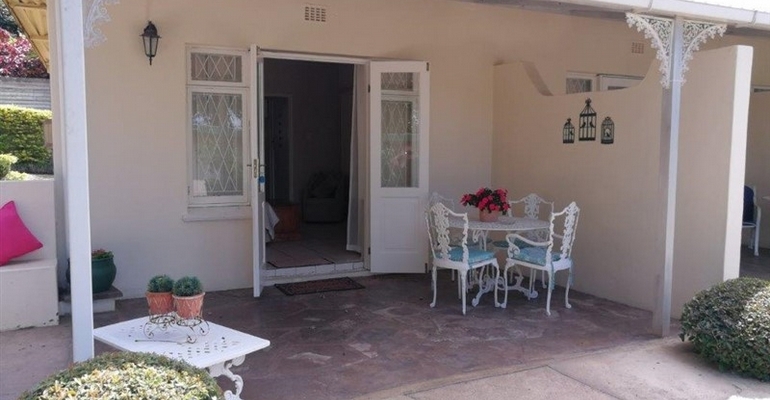 The unit offers a lovely outside braai area with a beautiful garden for kids to run wild and play freely. The garden rooms offer a double bed, King or singles with extra mattresses and a camp-cot for small kids that can be provided at no extra charge on request. Bath towels are provided. The room is semi self-catering with a bar fridge, microwave, kettle, toaster with all the crockery and cutlery available, as well as braai facilities. There is DStv, free Wi-Fi and daily cleaning services included. The unit offers partial sea view's and a lovely garden view with a private veranda right next to an aviary with little birds.